Dr. Crystal Johnson is an Assistant Professor in the Department of Environmental Science, School of the Coast and Environment, at Louisiana State University in Baton Rouge, Louisiana. She is currently examining how Vibrio spp. (V. parahaemolyticus, V. vulnificus, and V. cholerae) respond to environmental cues, including sea surface temperature, salinity, chlorophyll, turbidity, suspended particulate matter, and dissolved organic carbon. "You can’t tell me what I can’t do." 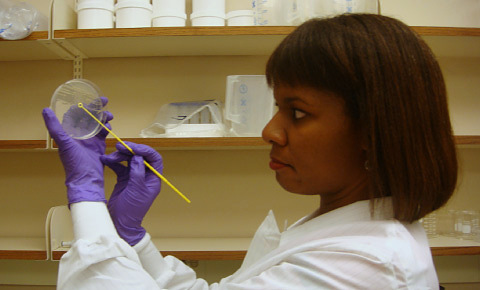 Crystal also has a very strong commitment to outreach, expressed through her work with COSEE Central Gulf of Mexico (CGOM) as well as the establishment of several student-based programs, such as the Summer Research Internship (SumRI), in which two high school students spend six to eight weeks in her lab. Some of her colleagues refer to Crystal as "obsessed". It is true that she spent $1000 dollars out of her own pocket to support undergrads until their stipends were approved. It is true that she often eats lunch and dinner at the lab. She's also a self-described germaphobe who can't swim, who spends all her time investigating toxic seafood. And she's always surprised how much she stands out in people's memories. 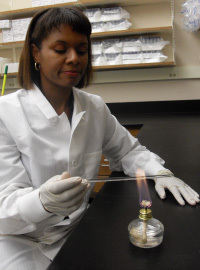 Growing up in Smallpoint, Mississippi, Crystal didn't know what a scientist looked like, had never been in a lab, and perhaps because of that had no preconceived ideas of what a scientist is "supposed" to be. "I like to tell people I had a low GPA, I was not the straight-A student, but I was excited about it and a hard worker," says Crystal. Being told she would never get a Ph.D. just lit a fire under her and made her work that much harder. "When I interview potential students I don't just look at their grades," she says. "If they have that fire then I pick those students. I pick them if I see a little bit of myself in them." Photographs and images for Crystal's pages courtesy of Crystal Johnson and COSEE Central Gulf of Mexico. Copyright © 2010-. The Centers for Ocean Sciences Education Excellence (COSEE). All rights reserved. This material is based upon work supported by the America Recovery and Reinvestment Act through National Science Foundation Grant #OCE-0943509 to the University of Southern Mississippi. Any opinions, findings, and conclusions or recommendations expressed here are those of the author(s) and do not necessarily reflect the views of the National Science Foundation.